A Bready or Not Original! The chewy cookie base contains lovely crunchiness from cookie chunks and white chocolate chips, while the cinnamon glaze brings sweetness and spice. If maple cream cookies are not available, substitute a full package of Golden Oreos and an extra 1/2 teaspoon maple flavor. Line a 9x13 pan with aluminum foil and apply nonstick spray. Preheat oven to 350-degrees. Combine the dry ingredients in a bowl. Set aside. Coarsely chop the cookies. Reserve 1/4 cup of the finer crumbs. In a mixing bowl, blend the butter, brown sugar, and maple syrup. Add the eggs and vanilla. Pour in the flour mix until just combined, then stir in the white chocolate chips and cookie pieces. Spread batter in the pan. Bake for 20 minutes, or until a toothpick comes out clean. Let the blondie layer cool completely. Place in fridge to speed the process along, if necessary. Combine glaze ingredients in bowl. Add enough milk to make the icing spreadable, not runny. Immediately dollop over blondies and smooth out. Quickly sprinkle on the reserved crumbs. Use fingers to gently press in. Place pan in fridge to set for hour or two. 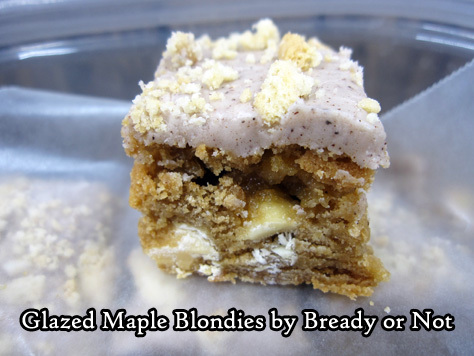 Use the foil to lift the blondies onto a cutting board for easy slicing. Store refrigerated in a sealed container, between wax paper layers.